Smatree® SmaPole S1 is made of high quality aluminum-alloy for lighter, stronger and lifetime use. Different from the other plastic head pole, SmaPole S1 is integrated with a fixed aluminum tripod mount that has a CNC molded aluminum-alloy nut, never to worry about losing. Really Convenience! Size: retract to 15.8″, extend to 40.5″. The pole is divided into 3 sections; each section has a fast spiral lock. Simply twist counter clockwise 1/4 round to release, choose your desired length, and twist clockwise to lock. 6.3″ of Sponge coil around the bottom of the pole to avoid user’s hands be ground injury, user can control the shooting angle of the camera more easily as well. As the pole bottom is equipped with a blue cord buckle can prevent pole from falling or losing when you are surfing, or going on high-speed movement. Smatree aluminum wrench is designed to tighten your screws, whatever Smatree screws or OEM screws. It strengthen your equipment to the most stability when you are surfing, racing, parachuting etc. 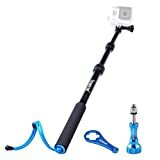 This entry was posted in Discount Photography and tagged 15.8″to, 40.5″, 5/4/3+/3/2/1/Session, Allaluminum, Alloy, GoPro, Handheld, Hero, Pole, SmaPole, Smatree, Telescopic by Ball Photo. Bookmark the permalink.